History and company information The name Maurice Lacroix stands for decades of experience in the production of high-quality watches. Thanks to its first own manufacture movement and the own production of complex movement components, Maurice Lacroix took at the end of 2006 the last step toward becoming an exclusive Manufacture brand. The Maurice Lacroix technical office, watch workshops and case factory in Saignelégier are among the industry’s most modern. 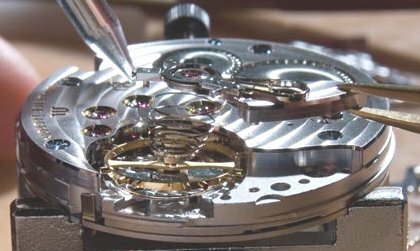 Here, all the factors crucial to the successful production of outstanding timepieces converge: creativity, watchmaking experience, skilled craftsmanship, industrial expertise, technological proficiency and – last but not least – a pronounced sense of quality. Today, some 150,000 quality timepieces leave the workshop in Saignelégier every year, finding their way to customers all over the world. Maurice Lacroix, with some 220 employees worldwide, ranks among the most successful Swiss watch brands in both national and international arenas. Thanks to having its own companies in Switzerland, Germany, the UK and the USA, branch offices of the parent company Desco von Schulthess AG in the Far East and Australia, as well as distributors around the world, Maurice Lacroix has gradually captured all the internationally important watch markets. This means that Maurice Lacroix presently has its timepieces in some 3500 carefully selected shops in over 60 countries.